Resinova’s Resibond Clear 330 silicone has come my way through a Pune based member of the Mosaic India group. 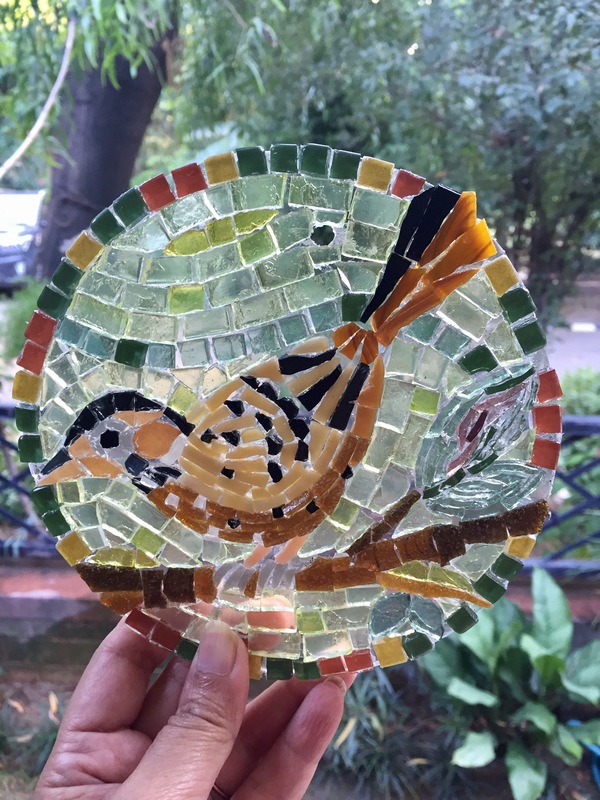 She had used the product to adhere stained glass to acrylic window panes and the adhesive dried clear. Later, I found the company website and emailed them an enquiry as I couldn’t find the product online. The email response gave the name of their NCR marketing representative, who called a little later to understand my application and pointed me to 2 of their products. He checked with his staff and also gave a shop’s name close to my location where I was likely to find the products. I went over to South City Hardware and Sanitaryware in South City-I market (Gurgaon, Haryana, India) and did find this silicone in 20 ml tubes. It cost Rs30/tube. 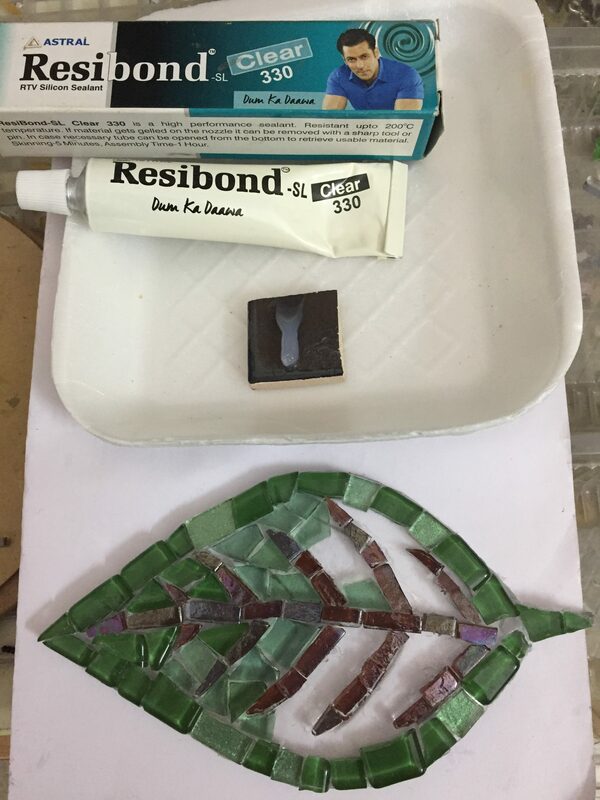 I’ve now used the adhesive to create the glass-on-acrylic mosaic in the image and it acted fine. It was easy to dispense, gave 10-15 minutes to move around the tesserae and started firming up. By the morning, the tiles were fairly firmly adhered. I decided to pry loose an odd shaped tessera with a pick the next day to cut it and paste the 2 pieces again, and that too worked well. The mosaic got grouted without any major problem. The tiny specks inside the bird moved around a bit indicating the need for a bigger tessera surface with the adhesive on it to hold the substrate more firmly, but they didn’t come off. The main learning was that the silicone is best applied smoothly on the (transparent) tile or, preferably, all over the substrate to prevent gaps from forming under the tile for the grout to seep in and remain visible through the transparent tiles. As far as this product goes, I’m pleased to see silicone available in small tubes so one isn’t forced to cut open a big caulk for a small mosaic any longer. I’d like to request the company through this post to make the product available through Amazon India so one can source it easily. Meanwhile, those in the NCR can get in touch with the NCR marketing representative for locations of dealers/stores that stock the Resinova products. Others can email the company for stores near their locations.